It only takes ONE time to ruin your blog. You probably don’t think about hackers like Neo cracking the vault to your blog on any given day, but the truth is there are SEVERAL different ways your WordPress site can be brought down in flames. And it only takes one crash/hack with NO backup to make you curse Pat Flynn and the other blogging gods. You don’t want to be that blogger. The good news? You can rest your mind at ease easily (and for free) with a few certain plugins and tools to bump your site security and backup your site regularly. This post will guide you through my simple recommendations for each category, and provide some general tips for protecting your site along the way. Important note: You do NOT have to implement all of these ideas and install ALL these plugins. For one, having more than 15ish plugins in total can actually affect site speed, which is bad news! 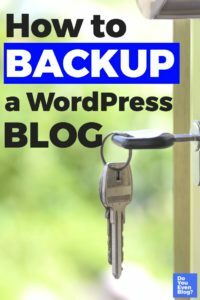 Keeping occasional backups is the SINGLE BEST TIP for site security on your blog. Site crashes because of a silly host? Install a backup. Content gets deleted because you did something stupid? Install a backup. There is absolutely no excuse for not regularly backing up your site. This includes money and time! There are most certainly free tools to automatically backup your site, and they literally take a few minutes of your time. Updraft is what I use, and is probably the widely-used backup plugin…for good reason: It has an awesome free version! You can find install it by searching “updraft” in your WP plugins dashboard, or at The World’s Most Trusted WordPress Backup Plugin – UpdraftPlus. Also, even the free version allows you backup to remote storage sites like Dropbox, Google Drive, etc. This is why they’re awesome. Here’s a fun gif I made showing how easy it is to start a backup. The pro version starts at $70 (not a subscription. Lifetime access), which not a terrible deal, especially if you’d like to automate daily backups. Many of you probably already use Jetpack for other stuff on your blog…it’s a huge tool that’s made by the same team that created WordPress. Jetpack actually bought the Vaultpress plugin, which was one of the huge backup tools alongside. Cons: I personally hate Jetpack, and there’s no free version. You can find more info about Jetpack Personal backups here. You’d think we’d be able to file this under the “well duh!” category…but let’s face it: we hate complicated passwords, and we hate CHANGING passwords constantly, so most of us don’t do it. Make your passwords effective, and change them every fortnight or so. Quite frankly, you don’t need to know HOW to do that, what you should do is grab a password manager. free version is MORE than enough. It generates super-tough passwords for you (and remembers them so you don’t have to). Most of you have probably already heard of password managers, so if you’re not using one already, please do so. 3 – Use a security plug-in! Tagline: If you really really want to. Most of the bloggers I know don’t actually use one of these, probably because an attack is actually quite rare (especially if you protect log-ins w/ authentication and awesome passwords). However, you’d like extra protection, WordFence is king! Wordfence is the go-to free recommendation (the premium is roughly $99/year I believe). So I’ve never used iThemes…but their plugin suite looks awesome. A few other cool things. This could be worth looking at if you’re seeking a backup plugin AND advanced security plugin. This another easy “well duh” security tip for WordPress. Simply put, there are loads of easy plugins for filtering out bots and hackers trying to log-in to your site. Grab the Google Authenticar plug-in in your WP plugins dashboard. It’s free and awesome. There are a few plugins that do this, but let’s bring up iThemes again. 5 – ALWAYS keep WordPress up to date. WordPress issues updates every few weeks, and it’s generally a great idea to go ahead and update whenever you see the prompts to update! There almost always small security bugs and updates included in each release. The “prompt” to update is always featured prominently at the top of your WordPress dashboard when you log-in. It’s not just for protecting sensitive customer data. It’s about protecting ALL data sent between browsers and servers, making it extremely difficult for hackers to work their way in that connection somewhere. You can literally buy a Namecheap SSL starting at $9 a year. That’s affordable folks. (Even if your blog is hosted elsewhere btw). What other site security plugins, tips, tricks, etc can you recommend? I’d be curious to hear about them. Hi Pete, I didn’t even think of backing up my blog (noob right!) until i read your post. No using the free updraft plugin and all is well. I’d be distraught if i lost all my hard work. In hindsight I can’t believe I didn’t think of it sooner!